And so it goes on. Pagham’s worst run of results for many years carried on at Hassocks on Saturday, crashing to a 4-0 defeat that could have been much worse. An early double from Hassocks forward Phil Johnson just about settled the game there and then given the Lions lack of goalscoring prowess lately. The first came in the 11th minute when he blasted in following excellent approach play. The second came as he burst through a static Pagham defence, rounded keeper Jordan Matthews and rolled the ball into the empty net. With Pagham struggling to put anything of note together, Hassocks could easily have doubled their lead by half-time, but failed to get any efforts on target. The one time they did brought a marvellous save by Matthews snatching the ball off of the toes of Liam Benson as he looked to sidefoot the ball into the nest from a yard out. To make things even worse for the Lions, Daryl Wollers was injured and had to be replaced by Joe Ashmore just before the break. The second half started a bit brighter for the away side, although despite some better moves from them, they still couldn’t turn it into shots, at least, until 53 minutes in. George Bingham collected the ball in midfield and moved forward before unleashing a fierce shot from 25 yards that, unfortunately, was straight at the Robins keeper Josh Green. It was the first and only Pagham shot on target of the whole game. Things were soon back to normal and Benson gained his revenge on Matthews when he scored Hassocks’ third, picking up a last-ditch clearance by Jamie Horncastle and smashing in the net from five yards. 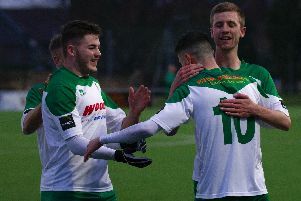 The scoring was completed after 77 minutes when Will Broomfield prodded home from close in as the Lions failed to clear a free-kick. The Robins almost had a fifth when a header was disallowed for a push on the keeper and Pagham just managed to hang on before the final whistle ended their misery. Pagham visit Langney next Saturday. Pagham; Matthews, Wiggans, Williamson, R Davidson (booked), Wollers (injured), (Ashmore), Horncastle, van Driel, Bingham (Prisk), Brady (booked), Murfin, Hands (Hubbard).